A baby dragon, or a bad joke? 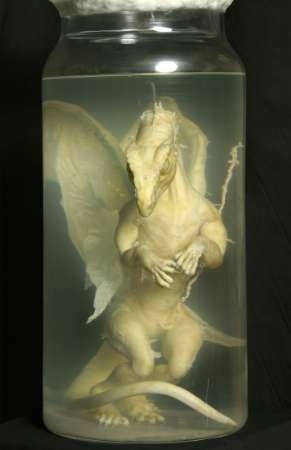 A pickled “dragon” that looks as if it might once have flown around Hogwarts has been found in a garage in Oxfordshire. 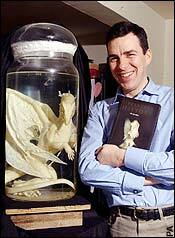 Yesterday the baby dragon, in a sealed 30in jar, was in the office of Allistair Mitchell, who runs a marketing company in Oxford. He was asked to investigate by his friend, David Hart, from Sutton Courtenay, who discovered it. A metal tin found with the dragon contained paperwork in old-fashioned German of the 1890s. Mr Mitchell speculates that German scientists may have attempted to use the dragon to hoax their English counterparts in the 1890s, when rivalry between the countries was intense. “At the time, scientists were the equivalent of today’s pop stars. It would have been a great propaganda coup for the Germans if it had come off. The documents suggest that the Natural History Museum turned the dragon away, possibly because they suspected it was a trick, and sent it to be destroyed. But it appears a porter intercepted the jar and took it home. The papers suggest the porter may have been Frederick Hart – David Hart’s grandfather. Yesterday the Natural History Museum said that it was interested in following up the find. The scientific journal Nature once carried a tongue-in-cheek article on the ecology of dragons written by Lord May, who became the science adviser to the Prime Minister and is now the president of the Royal Society. From the reported sightings, Lord May concluded that dragons are “both omnivorous and voracious”, with great variations in diet: one made do with two sheep every day while another, kept by Pope St Sylvester, consumed 6,000 people daily. Their lifespan seems to range between 1,000 and 10,000 years. 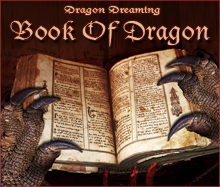 Some scientists believe that dragons, though the product of imagination, were inspired by the extraordinary creatures that once roamed the Earth. As J K Rowling’s alter ego Hermione Granger once suggested, legends have a basis in fact. 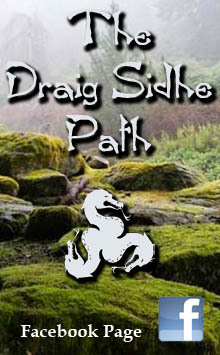 An author has won a lucrative contract for his first novel after staging a hoax involving a baby “dragon” to launch his writing career. Allistair Mitchell had grown frustrated after being rejected by more than 40 publishers and agents, so he devised an elaborate way of creating interest in his book before any pages had been printed. Mr Mitchell, 42, from Oxford, who writes under the pen name P R Moredun, invented a tale about a dragon being found last year. He contacted his local newspaper in Oxford in January, claiming that German scientists had created the specimen in the 1890s, suspended it in formaldehyde and sent it to the Natural History Museum. But, so his story went, the museum had dismissed the specimen as a hoax and sent it to be destroyed only for it to be spirited away by a museum porter and found in the garage of the man’s grandson, in London, last year. Mr Mitchell said a biopsy on the creature would be needed to establish if the creature was a fake. But it has now emerged that the tale of the Victorian hoax was itself an intricate stunt. The dragon had been created for Mr Mitchell by Crawley Creatures, the model makers behind the BBC’s Walking with Dinosaurs series. The jar in which it was stored was made by a specialist glass blowing studio in the Isle of Wight. Mr Mitchell, who runs a marketing company, even bought 100-year-old notepaper on which to create faked documents about the dragon’s history in copperplate handwriting. 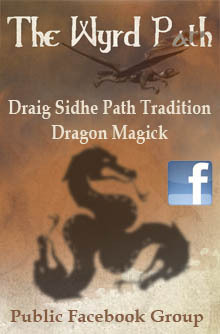 However, the discovery of the dragon received publicity as far away as Australia. Meanwhile, Mr Mitchell was using a photograph of it on the cover of copies of his fantasy novel Unearthly History, in a renewed approach to publishers and booksellers. They began to take notice. 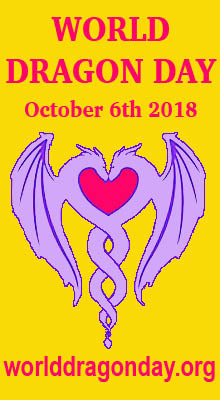 He has signed a deal with the booksellers Waterstone’s, under which they will promote the book, a thriller for adults and children in which humans are helped by dragons in a fight to save the world. 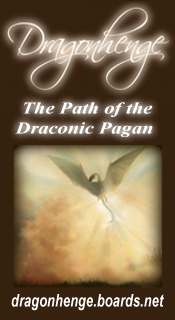 He has set up his own company, Rookstone, to publish the book. “Essentially I created the hoax in order to attract potential readers and to try marketing my book even before it was published,” Mr Mitchell said. The book is based on stories he used to tell his sons, Duncan and Edward, on car journeys. He had told them so often that it took him only 13 days to write the book. 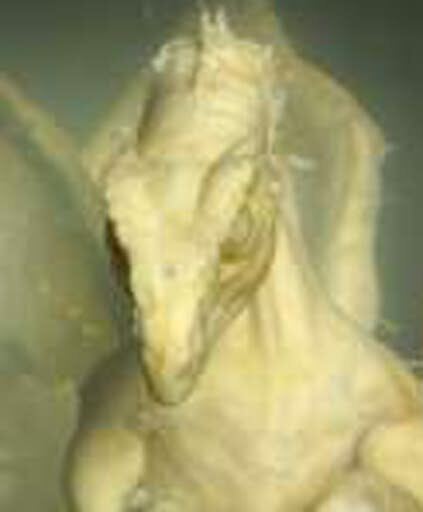 The model dragon, which has intricate details such as tiny teeth and an umbilical cord, has been insured for £500,000. The Darwin Centre at the Natural History Museum is likely to put it on display later this year. 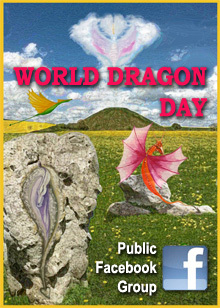 This entry was posted in Dragon Images, Dragon Myths & Stories and tagged Allistair Mitchell, baby dragon, baby dragon hoax, Crawley Creatures, fantasy novel, Natural History Museum, pickled baby dragon, Unearthly History.